24/2/16: Post updated with new options and new photos! When I was in New York City last year, I tried 2 yoga studios – Pure Yoga East and Bikram Yoga Grand Central. Around both areas (Upper East Side and Midtown East), there was an Organic Avenue shop within a 5 minutes’ radius. Generally for New York City, it’s quite easy to find healthy food places, especially if you’re looking around a yoga studio – you’d definitely find one. Such culture hasn’t landed in Singapore yet. Majority of the people here do not know much or have the desire to switch to a clean eating diet as an everyday thing. Kaya Toast and Fried Bee Hoon is a very acceptable thing to probably 90% of the people every morning. Healthy food stores may not survive well, but in my opinion, they stand a better chance if located near a yoga studio. As mentioned in my earlier yoga post, a change in lifestyle and diet should complement the practice to bring out the best. The most obvious change which will happen if you practice daily is intake of water – I definitely drink a lot more water than I did before. I also became more aware and mindful of the nutritional values of food I choose. I prepare my own meals usually but sometimes it can be more convenient to simply eat out. I have shortlisted a few healthy eating place near various yoga studios here. This is not listed based on a particular diet (eg. not all are vegetarian or low carb) but just cleaner than usual food in general. I chose not to include salad booths like Salad Stop, Munch Saladsmith or Cedele because healthy eating can be something more than just salad. Be careful when ordering from healthy looking food shops like Subway or Soup Spoon. There are not so healthy items on the menu which are elusive and people tend to let their guard down while ordering. Certain items on the menu may actually be high in fat, sugars, processed for all you know even though the calorie count reflected may be low. To dine here healthily, I suggest analyzing the nutritional values of each item on the menu before mindlessly ordering. There are also many vegetarian restaurants which I excluded simply because I don’t think vegetarian necessarily means healthy. They could be using more starch in their food than usual or perhaps the cooking methods involves frying. Instead, I tend to follow the paleo way of life even though I do not require meat at every meal. Therefore, my listings are places with carb free options to fit paleo followers. Generally, any place which serves quinoa is a clean eating place to me. My yoga studio is located at Somerset and between Raffles Place/ Clarke Quay so I tend to eat around this area. To make this list more useful, I’ve also included healthy restaurants from other areas near other popular yoga studios. Located in the same mall, I can’t believe it took me so long to discover this place. They have various quinoa bowls and the healthier option would be the salmon donburi on quinoa. They also serve non-clean centric food like pork belly so your unhealthy eating companion won’t have much to complain about! This restaurant is vegetarian but they do the dishes really well and some can even taste better than usual meat dishes, like their dumplings for instance. They put a lot of focus on quality ingredients like organic stuff so do expect to pay for quality. Well they may not have outright choices of healthy dishes but you can easily get lots of veggies and meat here, suitable for Paleo eaters. They collaborated with Panasonic to offer vegetables from Panasonic farm and the veggies (in the salad above) was exceptionally fresh and crunchy! Homegrown produce always tastes fresher and better than imported ones. They basically offer the around same menu at all Real Food outlets. This place is popular among men because the menu is protein centric. You fill up a form choosing your main protein, a complex carb and a few toppings. In a way, this is like a protein salad place. I’ve tried the sirloin steak and it actually exceeded my expectations.The tilapia fillet wasn’t that good however, because the portion was huge and it’s quite bland. 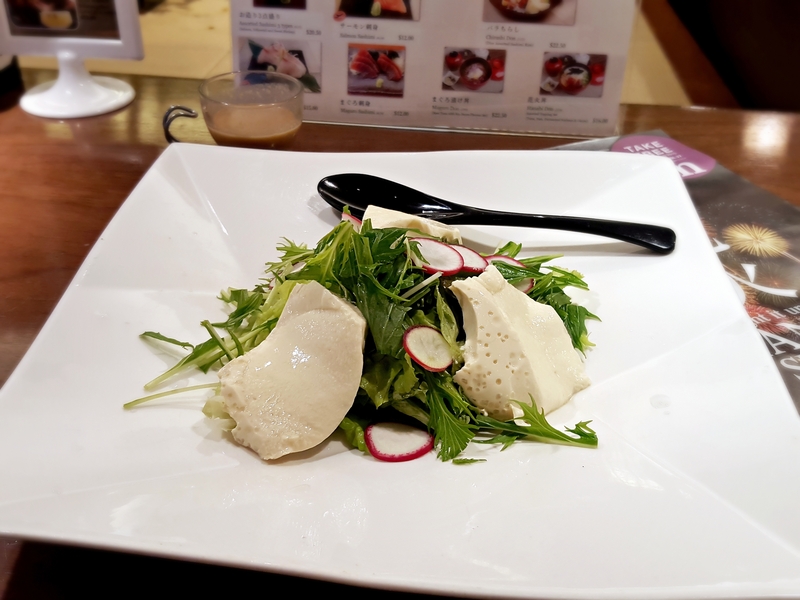 It’s also nice to note that they have sous vide egg (aka onsen egg/ 62-640C egg) here as a topping, and such eggs are usually marked up in restaurants! In any case, you can easily have a paleo meal here if you choose the right ingredients. This place is popular among women somehow because the items seems low fat and healthy. And perhaps the names of their items are really cute like Reindeer, Penguin, Whale etc. 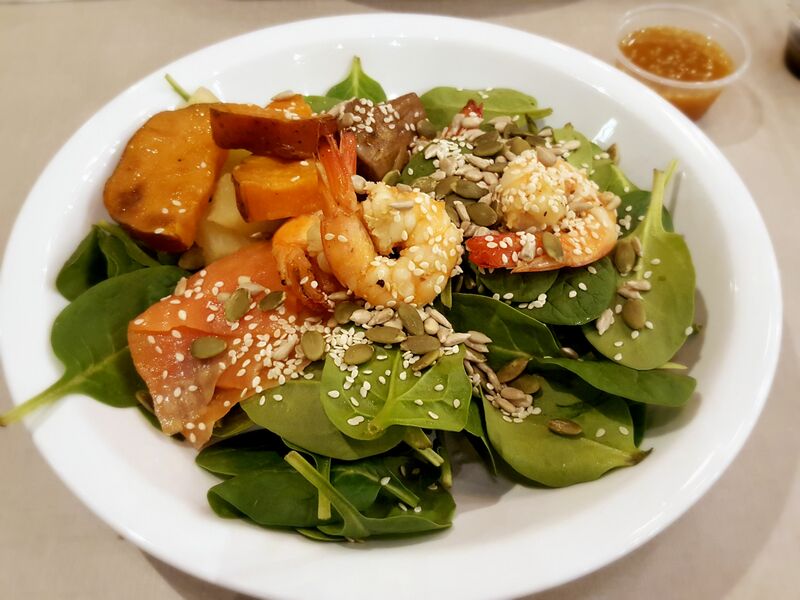 The concept is simple – they serve mainly soba salads with some protein like salmon or chicken so it’s quite a balanced meal. For carb free options you can have salad leaves only or shirataki noodles which has 0 calories instead of soba. For those who eat carbs, they have brown rice too. What sets this apart from other vegetarian food is simply because it’s delicious! Mushroom is used mainly to replace meat and that’s good because it’s not flour. The rendang is my favourite. The soup is also very flavourful. Honestly the menu doesn’t look super appealing (looks like everything I could do at home!) but it’s paleo for sure. One good thing is that they serve paleo breakfast too! 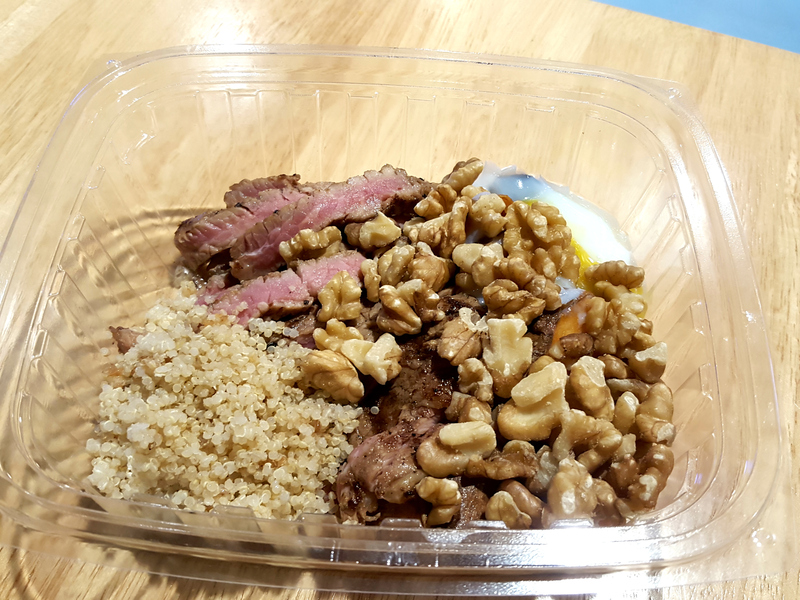 There aren’t many options for paleo breakfast in Singapore really, unless you prepare it yourself. Everything you find in the morning is unhealthy. I love how quinoa bowls are becoming more accessible. This place is run by the people behind Kilo and I can feel the same vibes. I had breakfast here and the oatmeal was good. The menu at the shop was kind of confusing because it doesn’t really explain the contents of the bentos and there aren’t many pictures for reference. I like the idea of zero calorie “noodles” and I ordered the laksa flavour, with salmon which looks more poached/baked than grilled. The salmon was still decent though. Overall quite good for a low carb meal. I haven’t tried this one yet but their concept is about no processed food and good ingredients, farm to table. Tanjong Pagar isn’t near my yoga studios so I haven’t got the chance to try but I like their wide selection of meat on the menu. What’s different from other salad places is that they have kale! Kale isn’t commonly seen in Singapore right now. The options for protein is quite unique too. They actually have lamb (+$3) – something rarely seen in my opinion. The ingredients here are suitable for clean eating too, many carb free. They have a lot of quinoa, kale and avocado. Definitely not the usual salad place.The all day breakfast also looks interesting as it has a much healthier twist involving avocado in their creations. Mainly a juice cleanse program provider but they offer smoothies too with the usual superfoods like chia or acai. This is the latest and third outlet of WHEAT. The menu here isn’t paleo friendly because this is a vegan restaurant, hence there’s no restriction with the carbo and sugars. Expect normal food sans animal products. However, they do have healthier options to choose from. I loved the Avocado Coconut Smoothie, probably the best avocado smoothie I’ve ever had! But their food tastes normal only to me. For instance, the dumplings in the dumpling soup were wrapped quite loosely, pale in comparison to Real Food’s. 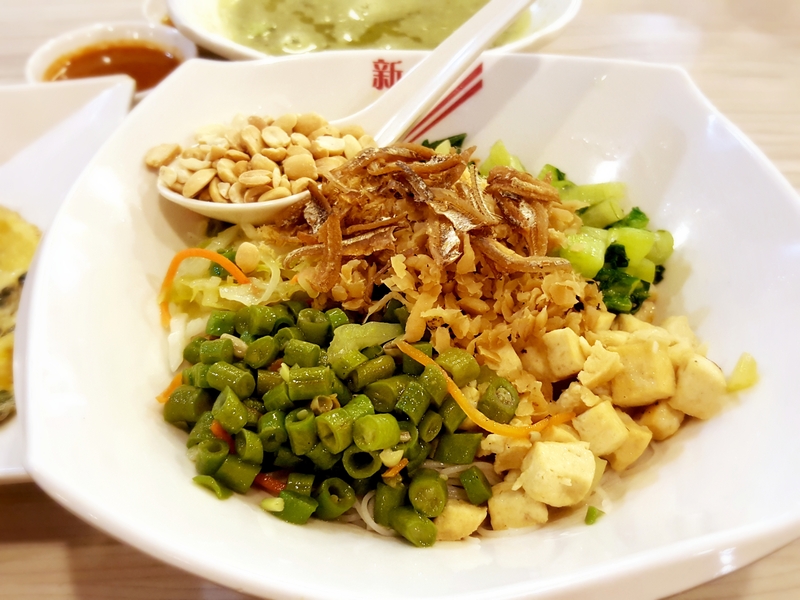 This originated from Hakka origins and is a rice bowl full of assorted veggies. Surprisingly it is delicious and packed with flavours! You can choose the base to be white rice, brown rice or vermicelli. It claims that it will “increases metabolism rate and in body detoxification as it helps to drain excess body fluid waste… improve bodily functions, ease digestion, and ease chronic bronchitis. It is effective for chronic rheumatism and arthritis, inhibiting cancer cell growth, helps treat diabetes, and lower cholesterol level. It enhances relaxation and promotes good sleep as well as improving skin texture”. With such claim it’s definitely making it to this list. I haven’t tried it yet but the menu looks so delicious and healthy with a very wide variety. This is Orchard and in a 5 star hotel so the prices are expected to be higher. Orchard really isn’t the place to go when looking for healthy food so as much as I would like to exclude salad places, this seems to be the only lower cost healthy food shop around Orchard station. However, this place does have protein options so a filling meal may be possible here. They only serve açaí bowls and smoothies here so it’s not really a full meal option but good to have. Their açaí bowl is packed with superfoods on top of a blended açaí base. Honestly when I first saw a picture of it months back, I wasn’t impressed because it looks way normal. However, it was love at first taste. It’s insanely delicious and I hope it stays in Orchard forever because I haven’t been to Holland Village in 5 years and don’t foresee myself anywhere near there in the next 5. I did not want to include this place earlier because salad stop used to serve just salad, but now they do quinoa bowls too! Honestly it’s hard to find healthy food in the heart of Orchard so this is the best option I can find. Other outlets of Salad Stop serves Açaí bowls too. I ordered the Chihuahua quinoa bowl but swapped roast chicken for grilled tofu, and cheddar cheese for more avocado. I loved it!